Slow. Cooked. Two words that, when used separately, are not particularly exciting. But put them together, and I challenge anyone to not start licking their lips. Follow 'slow cooked' with 'barbecue beef'...and wow. Just wow. It quite simply does not get any better. I originally intended on using beef brisket for this recipe, but unfortunately my local butchers didn't have any available. The young chap did, however, recommend this nice piece of topside beef and not wanting to walk away empty-handed I obliged. It worked beautifully. I started with a piece that was just over a kilo in weight - bang it in a tray on top of some sliced leeks or a couple of onions. Homemade barbecue sauce. Unbelievably simple and totally delicious. Dice one large white onion and three garlic cloves. Sweat them off in a dash of vegetable oil and then add 2 tbsps brown sugar, a tin of chopped tomatoes, 1 tbsp tomato puree, 1 tbsp ketchup, 1 tbsp soy sauce, 1 tbsp worcestershire sauce, tbsp maple syrup, 1 tsp red chilli flakes and a dash of salt and pepper. Let it simmer for 10 minutes or so and then blend until it's smooth. Pour half of the BBQ sauce over the beef, then stick it in the oven at about 140C for 2 1/2 hours or so, until the beef is nice and tender when you stick a fork in it. Leave it to rest for at least 30 minutes whilst you start putting together your dry rub (a dub dub). Most rubs go on before the cooking, but I wanted to try something a bit different because, why not? By coating the beef and then quickly searing, the thin slices of beef will retain all of the flavours and spices of the rub, and will give you a nice kick when eating. For the rub, mix 3 tbsps black pepper, 2 tbsps salt, 1 tbsp each of sugar and onion powder, 2 tsps garlic powder, 2 tsps chilli powder. Mix it all up and massage it into the beef like it's the love of your life. In a hot pan, sear the beef on all sides so you get a nice charred bark. The smells will be outstanding. Now is when you can start patting yourself on the back for making awesome food. Slice the beef thinly, then add to a hot pan with a spoonful of the barbecue sauce that you set aside earlier. Heat it through quickly, the beef will start to tear apart. You'll know it's done when the drooling is too much to bear. Chuck it in a seeded bun, serve with coleslaw and your favourite beans. Slow-cooked perfection. 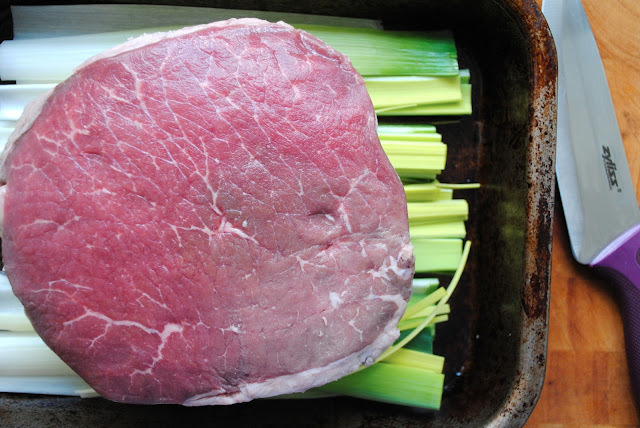 Silly question.....as my missus doesn't like leeks we'll be cooking the beef on a bed of onions. Is it best to dice the onion for this or just slice it so the onion is still ring shaped.....or doesn't it really matter? not a silly question at all! the leeks/onions are just there to lift the beef off the bottom of the tray and impart a bit of flavour. i'd say slice the onions quite thick and let it sit on those. i hope you enjoy it, let me know how it goes!! Maybe, that’s an amazing thing, but I still prefer a biiiiig piece of meat! Even if I cooked it in cooker ;) If you think the same, just visit this resource to find your little kitchen helper!